When John Steinbeck’s In Dubious Battle was published in 1936, the New York Times wrote that “You would never know that In Dubious Battle was by the same John Steinbeck if the publishers did not tell you so.” After directing such formally and narratively challenging films as his adaptation of Cormac McCarthy’s “Child of God” and William Faulkner’s “As I Lay Dying,” James Franco’s work in adapting the Steinbeck novel could provoke a nearly identical response. Given how much he typically pushes back against traditional storytelling in his directorial efforts to date, you would never know that “In Dubious Battle” was the same James Franco if the producers did not tell you so. Remarkably star-studded and even more remarkably earnest, there are elements of “In Dubious Battle” that work but enough missteps to keep it from fully coming together the way one wishes it would. However, it's such an unexpected film from Franco the Director that it could easily get one more excited about his upcoming projects, including the highly anticipated “The Masterpiece.” And it undeniably plays differently in the wake of worker strikes today for "A Day Without Immigrants" and greater divides between the working class and the President of the United States than when the film premiered at Toronto last year (which is not meant as a political statement, just a fact, and not an alternative one). “In Dubious Battle” is the story of the working class during the Depression, striking against an increasingly cruel establishment in ways that would lead to the formation of workers’ rights, including a minimum wage. It is an ensemble piece fronted by Nat Wolff’s Jim and James Franco’s Mac, two men who essentially form a union of workers after their wages are cut from $3 an hour to $1 an hour at the height of the depression. Jim is the younger, more naïve man, learning the ways to inspire his people from the more-experienced Mac. “In Dubious Battle” is about the cost of fighting for equality. It is easy to roll over and accept what one is given. It is much harder to fight for what one is owed. Franco fills his ensemble with recognizable faces, many of whom give great one-or-two-scene performances. Most notably, Vincent D’Onofrio shines as London, a reticent leader to his people, and a negotiation scene between him and Robert Duvall as Bolton, the voice of the establishment, is the highlight of the film. As a director, Franco knows to get out of the way and let his veterans do that which they do best. So, D’Onofrio, Duvall, Sam Shepard, and Ed Harris give magnetic, lived-in performances. For the record, Franco himself is very good here as well. The problems come in the younger cast, which Franco doesn’t quite seem willing to direct to a degree that their characters come off as believable. Wolff’s non-performance is a hole at the center of the film, amplified whenever he’s alone with Selena Gomez’s miscast Lisa. There’s a notable divide here between the accomplished veterans and the younger players. The former look like they have dirt under their nails and life stories to tell. The latter look like they’re playing dress up. Most of all, “In Dubious Battle” falters due to the pacing of its earnestness. It’s a film in which characters often say exactly what they’re thinking and feeling and needing at any given moment. And when a film starts with that degree of existence as a “message delivery system” instead of presenting characters it has nowhere to go but melodrama. If the passionate speeches of the final act weren’t preceded by 100 minutes of basically the same sentiments they’d have more power. “In Dubious Battle” is monotonous in its messaging, working only when it allows itself to be a character piece less tied to Having Something to Say. 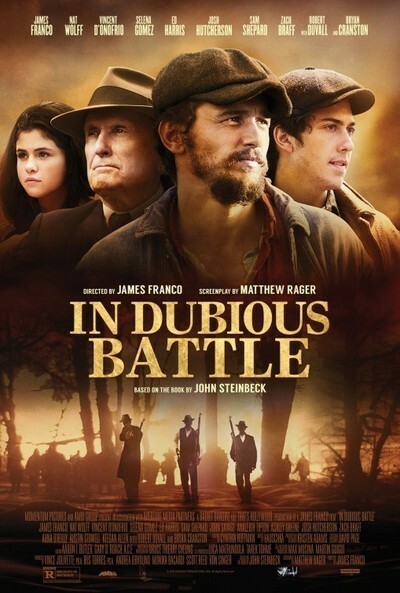 I never thought that James Franco would make a film that felt comparable to a John Sayles ensemble piece, but that’s what “In Dubious Battle” ultimately feels like. The difference is that Sayles is one of our best craftsmen when it comes to setting, making his location as important as his characters, and giving us worlds that feel lived-in instead of merely visited by a cast and crew. Still, the unexpected effort is appreciated. Some have claimed that In Dubious Battle was Steinbeck’s first major book (it would be followed by Of Mice and Men the next year and then The Grapes of Wrath three years later). Perhaps we’ll look back on the film version as James Franco’s first major directorial credit.